Villa Peparethos (named after the island’s old name) is located on a piney hillside in Stafilos, on the island of Skopelos. The endless green of the pine-trees and the olive-trees and the magnificent view from the paved verandahs of the first and the ground floor are in harmony with the house’s traditional architecture. Within 500m of Villa Peparethos is the main street that leads to both Skopelos town and to the beaches with a convenient bus-stop close by. 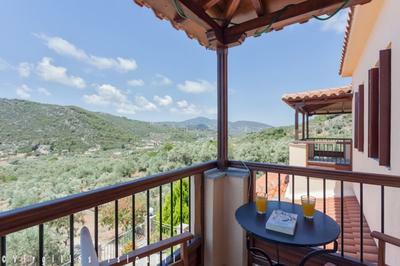 The Villa is located in a privately-owned olive grove of one acre that secures a quiet and calm environment for a pleasant vacation. The backside of the house borders with a pine forest where one can find a variety of birds, rabbits and pheasants that often “visit” the property. Cleaning of the house and changing of the sheets and towels every three days. 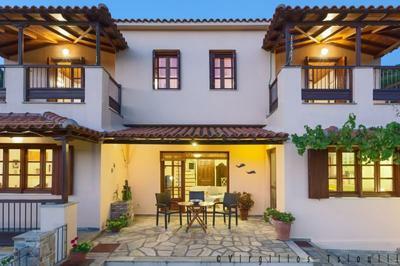 The Villa is ideal for friends and families who will enjoy the island hospitality, the beautiful beaches and coasts of Skopelos, the picturesque alleys of Skopelos town, and our churches, monasteries, museums, etc. 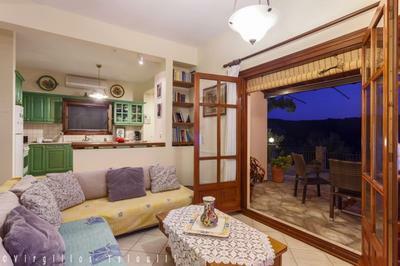 On the ground floor there is a large fully equipped kitchen, a dining-room, a living- room with a big corner sofa, a sitting room decorated with carved wood furniture and a fireplace, all in an open floor plan. On the same floor, there is a bathroom equipped with a shower. The beautifully decorated ground floor has an A/C and all the windows are equipped with mosquito nets for your protection from insects and for proper room ventilation. In front of the living-room a three-leaf door leads the way to a big paved terrace with an exquisite view where one can enjoy the summer sunlight, the captivating dusk and the moonlit nights. 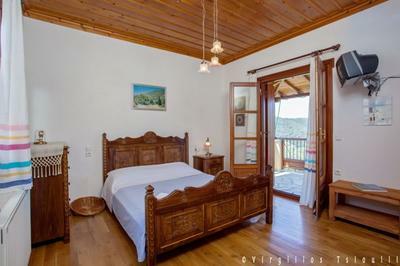 Inside, a wooden staircase leads to the upper floor, to the bedrooms and the main bathroom. Two of the three bedrooms of the house have access to their own paved balcony whereas all three of them offer a fascinating view of the Stafilos’ plain and of the hills that stand out in sharp relief against the sky. The bedroom at the end of the hallway is bright and cool, equipped with a carved double bed made from walnut wood, chiffonier/mirror, built-in wall closet and satellite TV. The second bedroom, right next to the stairs, is also equipped with a double bed, big closet, mirror and WC. The third bedroom has two single beds, closet, mirror and library, suitable for children, too. All of the bedroom windows are equipped with mosquito nets so one can enjoy the freshness of the forest and a delightful sleep. The bathroom of the floor has a bathtub, shower and washing machine. At the back of the house the paved yard is ideal for one to enjoy an afternoon coffee, sitting around the marble table. In the yard there is also an outdoor barbeque. Last but not least Villa Peparethos has a roofed private parking area where the car is protected from both the sun and rain. We welcome you at the port and lead you to the house. 1km distance from the nearest and most popular beach of Stafilos & Velanio.